Splash joined the Stockton Ports in 2005 and has been having loads of fun ever since! Kids, be sure to stop by and say "Hi!" to Splash when you come to Banner Island Ballpark. Splash loves to make new friends! Check out Splash in action! Career Notes: Ever since Splash was a young fur ball, this big-boned, big-bellied, bundle of fun has enjoyed being the center of attention. The Ports can't find a scale to weigh Splash, nor do we know when Splash was born. But we do know that Splash is full of fun, mayhem and has a pure love for taunting the visiting team. Splash's electric red fur will surely stick out in crowds and Splash can't wait to bring that special brand of fun to the Ports new home at Banner Island on a nightly basis. Splash is a big kid and likes to "splash" about in the Deep Water Channel and scarf down the Deep Fried Asparagus at Banner Island Ballpark. Splash enjoys stealing your food when you are not looking, welcoming young fans into the ballpark and leading the cheers for Stockton's team. Splash is always ready for practical jokes and always has a few helpful tips for the umpires. 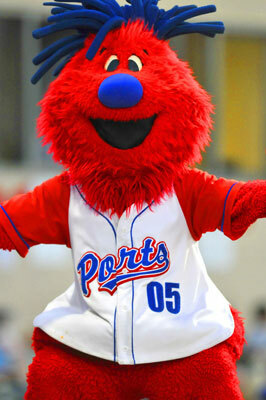 Check out the Ports' Facebook page! 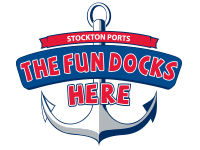 The Stockton Ports mascot, Splash, is quite the entertainer and frequently making appearances around the community. If you would like Splash to make an appearance at your event, contact Community Relations Manager Allie Bakalar at abakalar@stocktonports.com. All requests must be received 30 days in advance of the event you wish Splash to appear. Requests made with less than 30 days notice may not be able to be honored.